Thank you to all the students who participated in the Fair Poster Competition. We had many amazing entries and they are now decorating the school and making the campus very festive! We had a pizza party to celebrate Year 4 for being the year group that submitted the most posters. Well done Year 4! We had our first Fair T-shirt Day of the year Friday morning! The playground was filled with colour as Primary students proudly wore their Fair t-shirts. 2018 is an extra special year as it is the 35th Anniversary of CIS. We have created a new limited edition Raglan baseball shirt. Don't miss out on getting one! On site sales of t-shirts and CIS merchandise will continue next week in the lead up the Fair. You will have another chance to wear your Fair t-shirt next Friday, 23rd of November. Take a look at the amazing posters designed by our Secondary School students! Give them a hand for their creativity and skill! Only two days to go until the School Fair! It will be a fun filled day of games, activities, food, shopping and entertainment. Please remember to bring plenty of money (cash and/or cheque) to buy the CIS FAIR CASH. You will need CIS CASH to play games, buy food and participate in the Outdoor Games. Look out for the Coupon tables located around the school and listed in the Directory. We have managed to get the street closed for the Fair! This means no vehicles will be allowed on the road between 9.30am-6pm. Stroll along Hau Yuen Path and join in the fun with our clowns, balloon twisters, face painters and henna artists. Watch two street artists create wall art! Join them and work alongside them to create some colourful graffiti art. This year we have not one but TWO bouncy castles for kids of all ages.We've chosen a more challenging obstacle course so come and test your skills. NEW! Inflatable Rollers will have you laughing and spinning along the field. Roll with a buddy and double the fun! The field will also have fun basketball and soccer games run by our coaches - so come and learn some new moves! Once again, our wonderful CIS parents are running the Korean, Japanese and Taiwanese food stalls. This year we have added Singaporean/Malaysian and Thai. These tasty platters can be found at the Ground Floor Cafeteria. The doors will be thrown open and there will be plenty of seating inside. Head outside to the high top tables and check out additional food offerings at the Basketball Court. The Sausage Sizzle always draws in the crowds. Come early for a breakfast bap! There is beer on tap but please note that no alcohol will be served to minors or CIS students. If you are craving sausages, burgers and pizza look no further than the Basketball Food Court. Polish off your meal with a sweet crepe, popcorn or candy floss. This year our outside food vendors include Mak Mak, The Commissary, Pizza Express and Le Creperie. Grab some food and head out to the street outside Moongate where you can picnic at the tables and chairs. Our beverage providers include 18 Grams, Swire and Vita Coco. Come quench your thirst at the Basketball Food Court, Cafeteria or by the Primary Playground. Please do not forget that we will not be selling single-use plastic water bottles. BYOB - Bring Your Own Water Bottle and fill it up with water at re-filling stations located around the Fair. If you are hankering for a sweet treat then head down to the Carpark where you can pick up some delicious cakes, cookies, and lemonade from the Bake Sale and specialty coffees from 18 Grams. Sit down and enjoy your dessert at the Bake Cafe nearby. Our vintage clothing store will be located in the car park selling all sorts of excellent quality used items. Clothes, shoes, accessories for adults and kids - there is something for everyone. Come and find an amazing deal at our exclusive Designer Corner or head over to our Bargain Bin where you can buy a bag for $200 and fill it with as many items as you wish. The Bake Sale is back! CIS Parent Bakers have been busy baking and their delicious sweet and savoury treats will be on sale at the Carpark. There will also be tasty treats from many HK bakeries including Lady M, Blesscuit, Grand Hyatt, Chartwells, Cordis Hotel, East Hotel, Gold Coast Hotel, Seasons and The Commissary and many others. Gluten-free goodies are also available. Come early to snag your favourites! Purchase more than you can carry? No problem! You can store and pick up later. This year the Bake Sale is holding a Silent Auction of 8 delicious Lady M crepe cakes. Come bid and find out more! First session: 10am-12pm (4 cakes) Second session: 12.30-2.30pm (4 cakes). BOOKS! BOOKS! BOOKS! We can't get enough of them. We have a treasure trove of gently used and almost brand new books, CD's and DVD's. English and Chinese books, hardcovers and paperbacks, fiction and non-fiction. Pick up a few for your Christmas holiday reading or as stocking stuffers for friends and family. There will be a book for everyone! Shop Til You Drop! Our Marketplace is located around the newly completed Moongate. We have over 40 vendors selling. Vendors include: educational games from Baker and Bloom, First Code and the Genius Workshop, clothing from China Doll Kids, APA Outdoor Shop and MAKARON, jewelry from Candice Luk, Odile and Odette and Hilary Schwartz, organic food from Food Craft and Southstreams, Home & Interiors from DOMUS Home, Teresa's Turkish Towels, Ankyra, and Lego from Brick Shop. There is something for everyone! Perfect time to get your holiday shopping done. Come out and learn more about how our Secondary students are helping out in the community. Visit the stalls and find out how you can help and make a difference. Donate to a meaningful cause! Complete the Charity Treasure Hunt and head over to the T-shirt table to collect an extra 30 prize stamps. Get Set and GO! for the Primary Games located in the Lower Primary Gym and the Reception Big Room. We have an exciting roster of games run by our Primary parents that will keep you busy for hours. Come and have fun playing the games and collect Prize Stamps on your Stamp Card. Each Stamp Card holds 50 Prize Stamps. Stamp cards are available at all Games stalls and Coupon tables. Go to the Prize Stall in the Carpark to exchange your prize stamps for fun-tastic prizes. Don't forget to try your luck at Spin the Barrel, located in the carpark. Every spin is a win! CIS got Talent! Our talented Primary and Secondary students will be performing throughout the day. Schedule here! You don't want to miss the CIS Lion Dance Team perform after the Opening Ceremony at 10:30am. Join us for the ribbon cutting celebrating the newly completed Moongate. Come see performances by the Chinese Dance Troupe, Wushu team, and Gymnastics Club. Dance along with the Hip Hop kids and hum along with the accapella group, Enharmonics and the Jazz Band. Enjoy Abigail Arnold's solo and be amazed by the basketball tricks of Top Flight Coaches. Our Noon Concert will be held in the auditorium from 12.30-2.05pm. Come listen to the Junior, Pop Orchestra and Yangqin Trio. Sing along with the Concert Choir, Y2/3 and Y4/5/6 Choirs, Christian Club Choir and Ei Scholars/Stars. If you missed Clockenflap you won't want to miss our CIS Band Show. ACT6 will open up the afternoon outside on the purple stage at 2.15pm. Lama Toes and Twenty23 will be performing as well as the Year 9 and Year 11 bands. Staff Band FairPlay will close out the show at 3.30pm. Come and support all our performers. We continue our Green Initiative this year by being mindful of our impact on the environment. We are reducing Fair waste and our carbon footprint even more this year. Read on to learn more about how you can help BE GREEN at the Fair! Say NO! to single use plastic water bottles. Over the summer all our water fountains were replaced with modern, water re-filling stations. These stations remind us how many plastic bottles we save by re-filling our water bottles. Please bring your own water bottles to the Fair. Don't worry if you forget.....we have CIS branded eco-friendly water bottles on sale this week and Fair Day. Please note that we made a limited run so buy now while stock is still available. We WILL NOT be selling any single-use plastic water bottles at the Fair. HONG KONG landfills will be at capacity by 2019. We need to work together mindfully to take care of our city. Four Recycling Stations will be set up around the Fair. Please note the posters and dispose of your Fair rubbish responsibly. Bins will be clearly labelled. Please take the time to place your rubbish in the correct bins. Food waste will be collected for composting in the School Composter. There will be plenty of yummy cuisines to choose from in the cafeteria. Sit down and enjoy your meal with the Cafeteria's re-usable plating and cutlery. We are reducing our use of disposable plates and containers! Should you need them, take away containers and cutlery will be available for a nominal charge of $1. Vegware has generously sponsored the compostable food containers, cups and cutlery. Please dispose of them in the specially marked Vegware bins. Baguio will come at the end of the day to transport all Fair rubbish to the correct processing facilities. We will receive a report showing how much we have recycled and how we have lowered our carbon footprint. Do seriously consider taking the Phoenix Express, our free shuttle bus or public transportation up to Braemar Hill. Park your car or get dropped off at the Tin Hau MTR Station. The Phoenix Express runs every 15 minutes starting from 9.45am, with the last bus leaving CIS will be at 4.30. People taking the Phoenix Express will be rewarded with 10 free prize stamps! Collect a voucher when you are aboard the bus and claim it at the T-Shirt Stall at Moongate. Hau Yuen Path will be closed to vehicles from 9.30am to 6pm. Buses coming up from Causeway Bay include the 25A, 108 and Minibus 25. Buses from Tin Hau/North Point include 41A, 85, 27 and Minibus 49M. The 25 bus comes from Central. CIS merchandise will be sold outside the CCA Office alongside the Fair T-shirts. We have created a limited run of compostable water bottles, luggage tags, mousepads, umbrellas and sports and waterproof bags. Buy early to avoid disappointment. After last year's successful introduction we will continue to issue Prize stamp cards to replace the Prize coupons. Prize stamp cards will be available at all Primary Games Stalls or at the CIS Cash Tables. Each card can hold up to 50 stamps. If you participate in the Treasure Hunt or take the CIS shuttle bus (the Phoenix Express) you can earn bonus Prize stamps. Let's all do our part to GO GREEN AT THE FAIR!. Please help the CIS FAIR compost, reduce, re-use and recycle. CIS UNITED: STANDING TOGETHER FOR A GREENER COMMUNITY! The fair directory is being printed as we speak! They will be distributed to the kids at school this week and also be available at the Fair. Check it out to see how the fair is laid out this year. Food will be located in the Cafeteria and basketball courts, seating in the cafeteria and high top tables in the Food Court. Bouncy castles and other games such as soccer on the Sports Field. Fun basketball will be just outside in front of the field. Look for the clowns, face painters, henna artists and graffiti artists on the street. And don't forget to visit the carpark area for Bakesale, Books, Spin the Barrel, Vintage Clothing and Prizes! Last Thursday we had our second Vintage Clothing Pop-Up Sale at school. We had a wonderful array of donated products and very good quality pre-loved and brand new items. This year we also had a cashmere sale alongside our Pop-Up Sale. Both events were very well attended and there was an excited buzz all day as people came by to shop. A huge thank you to all those who donated items for the sale and also to the shoppers who came to buy items and support the school! Thank you! For those who missed out, come along to the fair and visit our Vintage Clothing store for more treasures! We had our first fair t-shirt day of the year last week. Thank you to everyone who took part. Take a look at the kids looking fab in their colour fair gear! We will have another T-shirt day next Thursday the 23rd of November, so please wear your T-shirts then! Last week, we had a Pizza Party for all the students who worked so hard on their Fair Poster submissions. We had over 40 students come to the Artroom to enjoy their pizza over Friday lunch. We want to thank all the students who submitted posters. It is great to get your participation in the run up to the Fair! You can see all the poster submissions at school - they are currently displayed at Moongate. Or here. 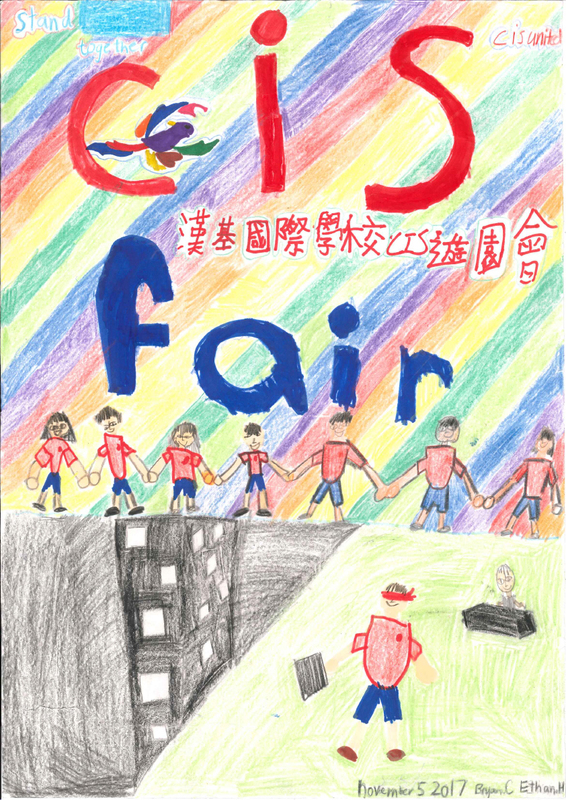 Our students have designed some amazing posters for the fair! Take a look a their artistic creations. Thank you again to the art teachers for co-ordinating and all our talented students for participating! There are many ways in which you can volunteer. Check out our volunteer link for some options. Or if you have a great new idea for the fair, please drop us a note! What an amazing day we had a the Fair. Check it out! Check out the Roots and Shoots team hard at work creating posters for our recycling drive at the Fair this year. Look out for their artwork near the recycling stations and hope they inspire you to recycle! This year the Fair is taking on the green initiative. We will be mindful of our impact on the environment and will reduce Fair waste and our carbon footprint. Read on to learn more about how you can help us go green at the Fair! This year, recycling/composting stations will be set up for fair goers to dispose of their rubbish mindfully. Bins will be clearly labelled. Please take the time to place your rubbish in the correct bins. All food rubbish will be sent upstairs to the cafeteria and will be composted in our school composter. There will be plenty of yummy cuisines to choose from in the cafeteria. Sit down and enjoy your meal with proper plating and cutlery. We are reducing our use of disposable plates and containers! Take away containers and cutler will be available for a nominal charge of $1.These containers are all compostable so please dispose of them in the specially marked bins. HK Recycles will come at the end of the day to transport all Fair rubbish to the correct processing facilities. We will receive a report showing how much we have recycled and how we have lowered our carbon footprint. Hau Yuen Path will be closed to vehicles from 8am to 6pm. Buses coming up from Causeway Bay include the 25A, 108 and Minibus 25. Buses from Tin Hau/North Point include 41A, 85, 27 and Minibus 49M. The 25 bus comes from Central. CIS ECO Bags will be available for purchase. $40 a bag or $100 for 3. Choice of 4 colours. If you spend over $300 at Books and the Bake Sale you can get a free ECO Bag. We will no longer be handing out prize coupons. Instead, Prize stamp cards will be available at all Primary Games Stalls or at the CIS Cash Tables. Each card can hold up to 50 stamps. If you participate in the Treasure Hunt or take the CIS shuttle bus (the Phoenix Express) you can earn more Prize stamps. Let's all do our part to GO GREEN AT THE FAIR!. Please help the CIS FAIR reduce, re-use and recycle. CIS UNITED: BUILDING A GREENER COMMUNITY! We have managed to get the street closed for the Fair! This means no vehicles will be allowed on the road between 8am-6pm. Stroll along Hau Yuen Path and join in the fun with our clowns, balloon twisters, face painters and henna artists. Watch two street artists create wall art! Grab a piece of sidewalk chalk and create your own artwork on the road. This year we have not one but TWO bouncy castles for kids of all ages.We've chosen a more challenging obstacle course so come and test your skills. NEW! Bubble Soccer is making an appearance this year and is aimed at the older kids. Check out this video to see how fun it is! The field will also have fun basketball, soccer and frisbee games run by our coaches - so come and learn some new moves! Once again, our wonderful CIS parents are running the Korean, Japanese and Taiwanese food stalls. This year we have added Indian and Thai. These tasty platters can be found at the L4 Cafeteria. The Sausage Sizzle at Moongate always draws in the crowds. Come early for a breakfast bap! There is beer on tap but please note that no alcohol will be served to minors or CIS students. If you are craving burgers, lobster rolls, shawarma, pasta, burritos or bubble waffles and salad look no further than our Moongate Food Court. This year we have an extensive range of outside vendors including Aberdeen Street Social, Cali-Mex, Cookieboy, Dining Concepts, EAST Hotel, Golden Pig and Pizza Express. Grab some food and head out to the street outside Moongate where you can picnic at the tables and chairs. Our beverage providers include 18 Grams, Africa Coffee+Tea, EAST Hotel, Killiney Kopitiam, Swire and Vita Coco. Come quench your thirst at Moongate. The bake sale is back! CIS Parent Bakers have been busy baking and their delicious sweet and savoury treats will be on sale at the Carpark. There will also be tasty treats from many HK bakeries including Lady M, Tai Tai Pie Pies, Grand Hyatt and Conrad on hand. Gluten-free goodies are also available. Come early to snag your favourites! Purchase more than you can carry? No problem! You can store and pick up later. Shop Til You Drop! Our Marketplace is located on Level 2 in the Year 1 Classrooms. We have over 40 vendors selling. Vendors include: clothing from Aanya, China Doll Kids, Loiz Cashmere and Mandarin Swing, jewelry from Odile and Odette, Marina Malison and Hilary Schwartz, organic power food from Peru by Pachamama Farmers, Home & Interiors from Pinstripe Interiors, Fabulous Towel Company, Maison Huit, and Lego from Brick Shop. There is something for everyone! Perfect time to get your holiday shopping done. Get Set and GO! for the Primary Games located in the Lower Primary Gym and the Reception Big Room. We have an exciting roster of games run by our Primary parents that will keep you busy for hours. Come and have fun playing the games and collect Prize Stamps on your Stamp Card. Each Stamp Card holds 50 Prize Stamps. Stamp cards are available at all Games stalls and Coupon tables. Go to the Prize Stall in the Carpark to exchange your prize stamps for fun-tastic prizes. Don't forget to try your luck at Spin the Barrel. Every spin is a win! CIS got Talent! Our talented Primary and Secondary students will be performing throughout the day. Schedule here! You don't want to miss the dragon dance and Opening Ceremony at 10:30am. Staff band, Fair Play, will be performing at 2:50pm on the purple stage. Come out and support all our performers! The fair directory is being printed as we speak! They will be distributed to the kids at school next week and also be available at the Fair. Check it out to see how the fair is laid out this year. And don't forget to visit the carpark area for Bakesale, Vintage Clothing and Prizes! Today we had our first fair T-shirt day of the year! Another one to come next Wednesday the 16th. If you haven't bought your T-shirt as yet you can buy them from school on selected days, please see here for more info. Everyone looks so colourful in their fair attire and super excited in the lead up to the Fair! Thank you to Simple Approach for generously donating our Fair T-Shirts. Last week we had our first ever Vintage Clothing Pop-Up Sale at school. We had a wonderful array of donated products and very good quality pre-loved and brand new items. The event was very well attended and there was an excited buzz all day as people came by to shop.